We were up at 6:00 AM this morning to the sound of distant thunder. After a check out the windows, we could see our neighbors were up, as well, so we went ahead and finished breaking down and pulled out of our spot around 7:00 AM. We stopped to dump the tanks and hit the road. 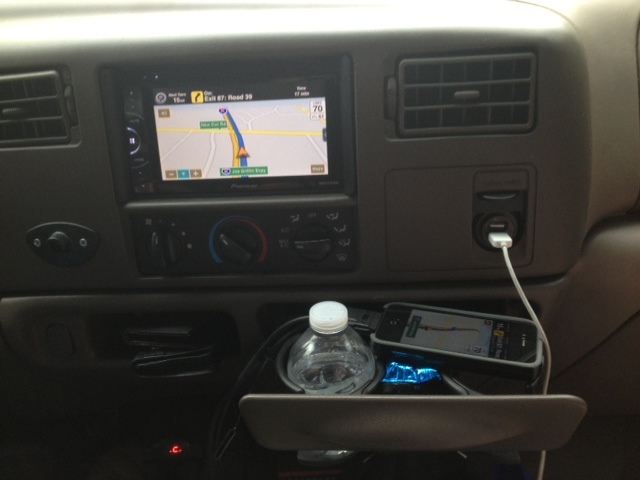 Today was the first day we tried using our iPhone GPS program (MotionX Drive) via the interface to the new truck stereo. It took a bit of getting used to, but it worked rather well. We might just get used to it instead of our TomTom unit (which is stowed in the console). You can make menu selections on the phone and the map continues to update on the stereo screen. Pretty neat. The voice prompts come in over the stereo speakers and it automatically reduces the music level for each announcement. We’ll see how it works out long term. GPS software running on phone and on stereo. We stopped at a truck stop northeast of Atlanta to eat lunch. 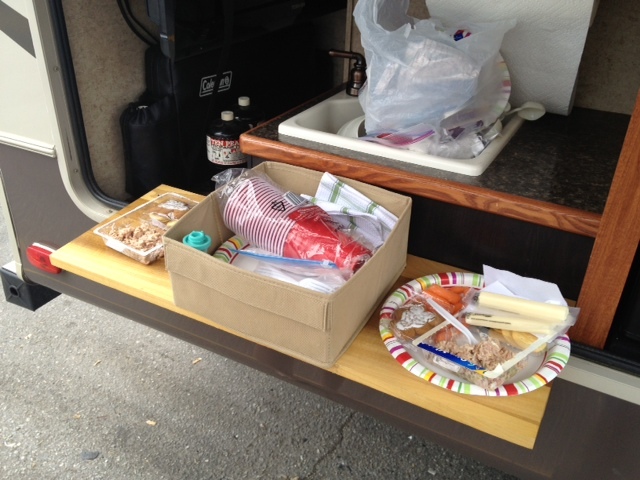 We used our new outdoor kitchen counter to prepare the meal then ate inside the truck. While we were there, we went ahead and filled up with fuel. Had we known that fuel was so inexpensive in South Carolina ($3.39 versus the $3.72 we paid), we would have waited. Such is life. We stopped at a really nice rest area inside of South Carolina (not the welcome center) that overlooked a lake. 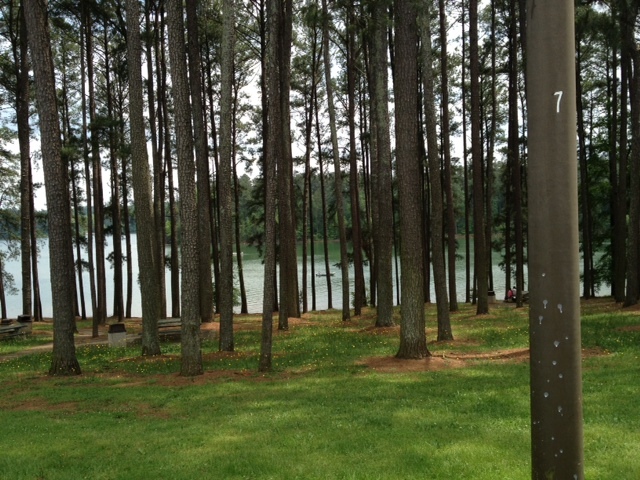 The picnic area was spread out down the hill to the lake, making for a very scenic view. Had we not eaten lunch earlier, we would have eaten here. We arrived at the KOA here around 4:30. The staff is great, the park is very nice. They took Malcolm around in the golf cart to look at spots before we paid. He selected one and came back to the office to settle up. 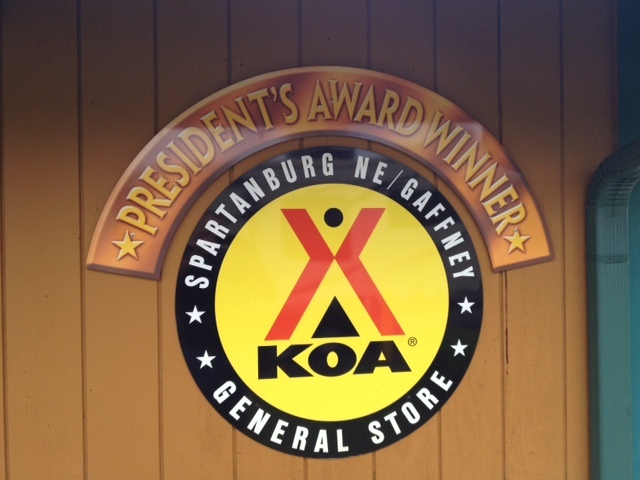 KOA gives value card members an additional discount if they reserve their spot ahead of time. Since we just drove in, they were nice enough to set up a reservation for us first, then checked us in, saving us a couple more dollars. 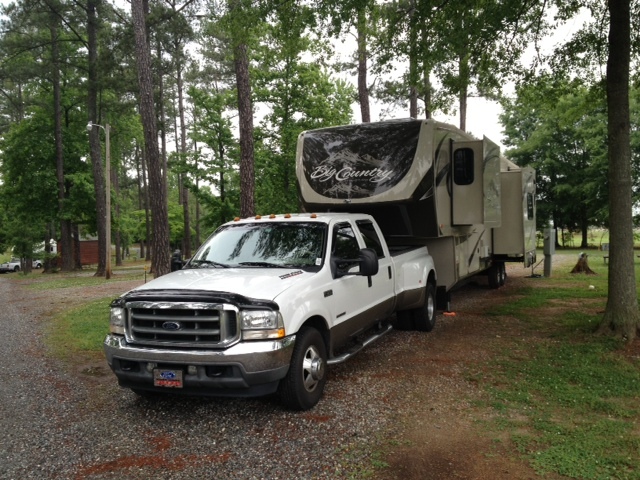 This KOA is highly recommended if you are heading up I-85 through South Carolina. We cooked dinner once we were set up. After dinner, we walked around and checked out the facilities. 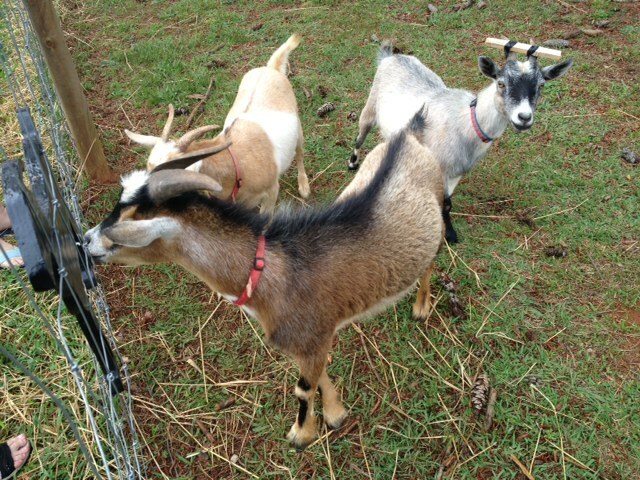 We ran across three goats that you can feed and pet. They were super friendly. The grey one has a stick taped to its horns to keep it from getting its head stuck in the fence. We stopped by the camp store and picked up some postcards to mail out. Once back to the trailer, we decided to go ahead and do a couple loads of laundry since they have a really nice laundry facility and nobody was using it. Malcolm wrote out postcards while we waited, then worked on a spreadsheet of our travels along with mileages. Starting today, he is tracking our travel miles (pulling the trailer) more accurately by taking a picture of the odometer at the beginning and end of the day. Prior to today, he has estimated the miles by entering stuff into Google Maps and getting the route mileage. As of the end of today, we have pulled our trailer 6,826 miles.